Adagio’s IngenuiTea teapot deserves to grab the number one spot because it shows just how far the art of tea making has come and how simple a process it can be. This teapot lets you brew your favorite tea and when it is ready, simply put your cup on it and the tea flows into your cup via a released valve. 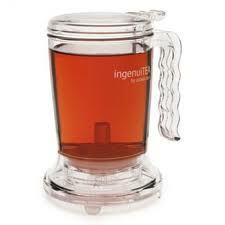 The tea leaves are effortlessly filtered out by the infuser making the whole process one simple step affair. It makes one 16 Oz. cup of tea at a go.